What drives you crazy while cooking at home? Blunt knife fails to cut the food while the hardly smooth cutting the food,makes the cooking badly annoying. It is time to polish your knife to make your cooking more convenient. Then our Bavarian Edge Kitchen Knife Sharpener will be your best choice! ◆Sharpen as you like, you can sharpen your knife with different angle according to your knife to reach best effect. ◆Best way to sharpen without removing metal. ◆High quality sharpening and polishing made simple. ◆Fast and easy to use, just a few times sharpen, you can see the obvious difference on your knife, but don't touch the blade with finger. ◆Stable, light weight and small size make your kitchen more convenient. Try Today with Our 30-Day Money Back Guarantee! Order This Excellent Kitchen Gadget Now and experience quality and safety! ★ HIGH QUALITY MATERIAL: Bavarian Edge kitchen knife sharpener sharpens ALL your dull knives in seconds, unlike an electric knife sharpener or sharpening steel that only sharpens a couple different types of blades;Made of ultra though Tungsten Carbide that flexes and contours to any blade or angle, much better than a knife sharpening stone. ★ UNIQUE DESIGN: Features two independent spring-action arms made of tungsten carbide that contour to your knife's edge better than a knife sharpening stone;Its independent spring action arms make knives razon sharp in seconds. ★ HIGH PERFORMANCE: Sharpens, hones, and polishes your old knives - give your chef knife and butcher knife a makeover; Sharpen, re-align and polish just by changing angle of the knife. Works equally on straight and serrated blades to maintain sharpness. ★ WIDE USAGE: Professional and portable knife sharpener works on all types of knife blades, like standard, serrated, and beveled;Professional and portable knife sharpener works on all types of knife blades, like standard, serrated, and beveled. ★ EASY OPERATION: Pull through tip down to cut a factory bevel, tip up to smooth and align the edge without removing metal. Press lightly for a fine blade for slicing blade. Press harder for a sturdy chopping blade. 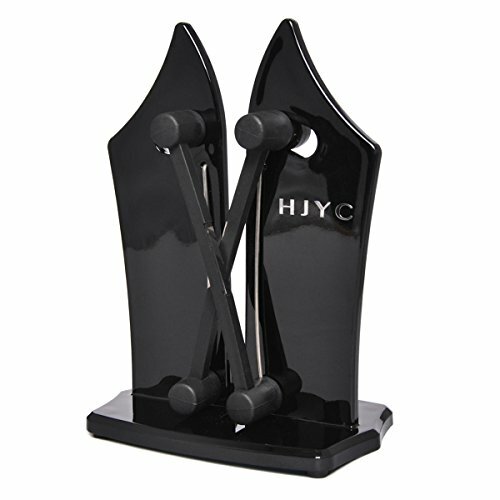 If you have any questions about this product by HJYC, contact us by completing and submitting the form below. If you are looking for a specif part number, please include it with your message.